From a marketing perspective, Final Destination might just be the most ingenious horror franchise of all time. The movies don’t rely on outmoded 20th century ideas like recurring characters or narrative continuity. The villain is death itself. Not even Death personified, just the concept. As long as there are young people and outlandish ways to kill them, there will be Final Destination movies. But in 2009, New Line started to worry that audiences had had enough. Final Destination 4 would now be given the ungainly title The Final Destination, with “the” implying it’s the last one. It would also be in 3D because of course it would. Turns out, people weren’t as sick of the franchise as New Line had thought. The movie became the highest-grossing entry to date, making another sequel inevitable. 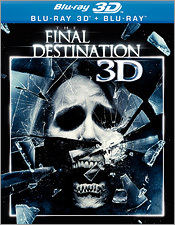 The studio went back to the original plan and Final Destination 5 hit theatres in August 2011. But if you didn’t know going in that The Final Destination was meant to be the grand finale, you’d never realize it from the movie itself. It certainly doesn’t provide any sense of closure. In fact, it barely feels related to the previous movies at all except for a FD’s Greatest Hits opening title sequence. In this entry, it quickly becomes apparent that the very same qualities that make FD an unstoppable franchise also make the sequels more than a little tedious. Each movie starts with a character having a vision of a massive accident (this time, it’s at a car race). Said character freaks out and manages to save himself and a handful of others. The survivors then begin dying in bizarre, Rube Goldberg-style deathtraps. The problem with this set-up is we already know why this is happening because we’ve seen the other movies. But since each sequel starts fresh with a new bunch of characters, they’ve got to figure it out for themselves. The discovery phase gets so tedious you want to step into the screen and hand the characters a copy of the original movie on DVD just so we can cut to the chase. Honestly, I don’t expect a great deal out of these movies. Their greatest accomplishment has been in demonstrating that pretty much every single household object could potentially kill you. But even by these relatively low standards, The Final Destination is a lazy piece of work. The accidents are by-the-numbers, lacking any of grim inventiveness of the first two films. Worse yet, much of the violence has literally become cartoonish thanks to an over-reliance on mediocre CGI, made even more transparent thanks to 3D. At first, the Final Destination movies at least had some fun with its concept. But director David R. Ellis is just going through the motions on this one. On the plus side, at least the movie’s short, clocking in at just 82 minutes. But it ends so abruptly, it feels more like a pilot episode for a Final Destination TV series than an actual movie. For the record, while this is a Blu-ray 3D release, I do not have a 3D home theater. Believe it or not, the promise of having computer-generated spikes hurled at me was not enticing enough to get me to drop a few grand on an upgrade. Once you put the disc into a standard Blu-ray player, it thinks for awhile, then gives you a message saying you’re not wealthy enough to watch this in 3D, please press Enter to continue in the considerably inferior 2D format. Still, the movie looks sharp in high-def, maybe a little too sharp. Whenever the CGI kicks in, which is often, it starts to look a bit more like a video game than a film. The DTS-HD 5.1 Master Audio track is pretty incredible, especially during the opening race sequence. There isn’t a ton of extra features and what there is fairly standard. Body Count: The Deaths of The Final Destination is your typical behind-the-scenes look at the creation of the death scenes. Two other featurettes focusing on the major opening and closing sequences include storyboards and pre-visualization animatics. You also get nine deleted scenes and two alternate endings. Sequels don’t get much more pre-fab than The Final Destination. With this entry, the series has officially become the Mad Libs of horror, plugging different words into the same old blanks. If this franchise is going to keep going, the least they can do is hand it over to someone with a little enthusiasm for it.